Practice Data Structures & Algorithms questions and answers for interviews, campus placements, online tests, aptitude tests, quizzes and competitive exams. 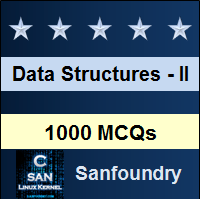 This set of Data Structure Multiple Choice Questions & Answers (MCQs) focuses on “Depth First Search”. 1. Depth First Search is equivalent to which of the traversal in the Binary Trees? Explanation: In Depth First Search, we explore all the nodes aggressively to one path and then backtrack to the node. Hence, it is equivalent to the pre-order traversal of a Binary Tree. Explanation: The Depth First Search explores every node once and every edge once (in worst case), so it’s time complexity is O(V + E). 3. The Data structure used in standard implementation of Breadth First Search is? Explanation: The Depth First Search is implemented using recursion. So, stack can be used as data structure to implement depth first search. 4. The Depth First Search traversal of a graph will result into? Explanation: The Depth First Search will make a graph which don’t have back edges (a tree) which is known as Depth First Tree. 5. A person wants to visit some places. He starts from a vertex and then wants to visit every vertex till it finishes from one vertex, backtracks and then explore other vertex from same vertex. What algorithm he should use? Explanation: This is the definition of the Depth First Search. Exploring a node, then aggressively finding nodes till it is not able to find any node. 6. What can be the applications of Depth First Search? Explanation: Depth First Search can be applied to all of the mentioned problems. 7. When the Depth First Search of a graph is unique? Explanation: When Every node will have one successor then the Depth First Search is unique. In all other cases, when it will have more than one successor, it can choose any of them in arbitrary order. Explanation: In the stack, at a time, there can be nodes which can differ in many levels. So, it can be the maximum distance between two nodes in the graph. 9. In Depth First Search, how many times a node is visited? Explanation: In Depth First Search, we have to see whether the node is visited or not by it’s ancestor. If it is visited, we won’t let it enter it in the stack.